I’ve never been a huge fan specifically of these two characters, though I’m familiar with them and have read a number of comics they’ve appeared in. They’ve just tended to be on the outer edges of the books I read, showing up for the occasional guest-starring role or cameo, or as part of a team in a team book. I’d read the Return of Hawkman arc in JSA a few years back, and a few issues of his own series heading into Infinite Crisis. The Atom I feel I’m most familiar with from Identity Crisis, and material I’ve read online about both Ray and the new Atom and their adventures post-Infinite Crisis. That said…this issue was quite enjoyable, rather accessible, and yet seems to have plenty for fans with ties to the characters going much deeper and much further back than mine. In the "tradition" of many of the Blackest Night tie-ins, we open with a recap sequence of sorts, focusing on the character’s life, leading up to their death. This time, though, it’s a recap of the character’s compassion, and why Ray Palmer–The Atom–was chosen by the Indigo ring for recruitment into the Indigo Tribe. The Black Lantern Hawks (as Hawkman and Hawkgirl were killed and raised into the Black Lantern Corps way back in Blackest Night #1) then attack, and there’s the usual discourse between Black Lantern and Hero, as Hawkman tries to get Atom riled up and his heart ripe for the taking. As the fight wraps up for the present, Indigo-1 tasks Atom with protecting her–keeping her alive–while she contacts other Indigos across the universe who can reach the other Lantern Corps (so they know to get to Earth, where all the Black Lanterns are headed). While protecting Indigo-1, Atom is forced to recall the events that lead off Identity Crisis, as he again faces the horror of what Jean did to attempt to win him back. As the issue closes out, Ray makes an important request–one that seems quite obvious, and is something I would love to see accomplished. This is definitely one of the better Blackest Night tie-ins. It seems that this issue’s events are more important and meaningful to the overall story than most of the tie-ins. 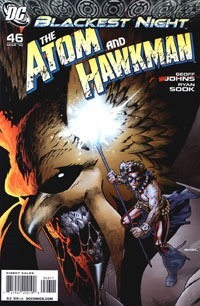 While we do get some Atom/Hawkman interaction, it hardly seems like enough to satisfy expectation. It is, however, appropriate enough to an issue of a two-character book, as it’s natural that one or the other character may take more of a leading role, depending on the given story. As what is essentially a one-shot, though, it’s a bit misleading. The issue having an important tie to the overall story is something that I suspect comes from this being written by Johns, essentially the orchestrator of Blackest Night in the grand scheme of things. The story touches on a number of elements–Ray’s role with the Indigos, a demonstration of what he can do with the Indigo ring, a confrontation with the Hawks, some resolution to things with Ray and setting a new course for the character–which makes for a very strong read. The recap at the beginning did more to clue me in on the past of the Atom than anything else I’d yet read (and I’m pretty sure answered my unasked question as to the premise of Sword of the Atom). Sook‘s art is high quality as well, and does a great job of getting across the visual aspect of the story. It just fits the story, and worked very well for me. All in all, a very strong one-shot issue within the Blackest Night arc. Though it remains to be seen how much–or what part(s) of this issue get recapped in the main mini…this seems to be a tie-in very much worth getting if you’re following Blackest Night, even if you’re not generally snagging the tie-ins. We begin this issue much like the other Blackest Night tie-in issues: a flashback showing us the memories a black ring is downloading to use with an animated/rebuilt corpse, concluding the scene with the command to the body to RISE. In this case, it’s Tara Markov again, and fresh off menacing the Titans, now she goes to her brother and the others of the Outsiders. As the Outsiders seek to find the truth about what’s going on, the readers know it’s not quite what they think–or want to think. Meanwhile: Tatsu, Violet, and Creeper are transporting Killer Croc, and bump into Black Lanterns of their own to deal with…Tatsu’s dead family. This is one of those issues that is far easier to read than it is to describe. Visually, I recognize everyone; the names I’m a little less confident with and have to search through the issue to find references (I’m pretty sure Tatsu and Violet are “civilian” names and not the characters’ codenames). With the Blackest Night: Titans mini and its flashbacks, and other series lately dealing with the Titans’ history and characters related to them, I have that thin understanding that works fine while reading, but isn’t strong enough for me to really “get” fully. In a way, that’s something on the writing; but at the same time, the fact that I can read the story even not knowing much about the characters nor their status quo prior to this point is more positive than negative. The art’s quite good; no real complaints from me. Everyone looks as I’d expect–if there’s any expectation–and at the very least, I recognize pretty much everyone. Even the Black Lantern has expressiveness…there’s a panel where one would almost feel bad for her, if one doesn’t keep in mind what’s been learned so far about these Black Lanterns. Probably the largest factor that makes this work so well for me is that it is written by Tomasi, who has been doing plenty of other writing within the Blackest Night event, and presumably he is incorporating enough that even without non-Blackest Night knowledge, there’s some building continuity just within the event’s story. All in all, a very solid tie-in, and certainly worth getting if you’re following either Blackest Night or the title itself. Then, of course, there’s also that little ring that ought to come with the issue, as well. A Matter of Anti-Life or Death! Oracle and her new friends take on the Calculator on a high-tech, virtual-reality front. Their battle eventually shifts to the real world, as “the cure” stands revealed. The art for this issue is consistent with the earlier issues. It’s not a style I’m all that thrilled with–there’s something to the art as a whole that doesn’t quite do it for me; that seems just a bit inconsistent from some panels to others (leaving aside obvious changes to represent what characters are seeing as ‘virtual reality’ in the game-world/internet log). The art is not horrible, but is not what I would seek out, and would not sell me on the issue. The story is a bit of a cop-out; I’m not sure how much of that is that this series is so SHORT after half a decade of being groomed into acceptance of the 6-issue arc as “standard,” and how much is other stuff. The events seem to be within the realm of what I know of the title character, but at the same time, I just don’t feel that there’s any real enormity to stuff going on; I’m not sold on the necessity of this mini’s existence. You can certainly find worse stories, and probably worse depictions of the character. Unless you’re a die-hard Barbara Gordon fan interested in any/all starring-role appearances, I don’t think this series has been essential to the character as yet; if you’ve bought the first two issues of the series, and enjoyed it, no real reason to avoid this final issue. We open on a view from outside Barbara Gordon’s new apartment building, as residents all react to flickering availability of power. We then move into seeing Barbara interact with her father, some other allies, hacker contacts, and so on, showing us much of what makes up the life of Oracle as she adjusts to being back in Gotham City after being gone for quite awhile. The story isn’t bad, though I’m not terribly enthused by it. Nothing really blows me away…in fact, a couple points actually strike me as extremely cliche. There’s a point that’s brought up several times throughout the issue that screams foreshadowing to me (and cliched foreshadowing at that). Additionally, what happens with one of Barbara’s hacker friends seems laughably unrealistic to me, like a plot point jammed in because there was no other way to have such a point occur otherwise. The art’s not bad. It seems vaguely generic at points, but comes across smoothly for the most part. Aside from some…questionable angles…you could really find a lot of art in comics out there that is far less appealing. What we have in this issue works for the story, and fits. The way the foreshadowing pays off in the next two issues will really inform how integral this series is to the Battle for the Cowl story as a whole. For now, this seems to be at least a nice tie-in that takes the context of the overall story and is telling a smaller aspect of that story with a particular focus that needn’t include the entire Bat-verse. Could be much better, but not a bad read if you’re interested in the character or having all the tie-ins and such. The main thrust of this issue follows several JSAers as they react to Gog’s “gifts”–reactions both positive and negative. Damage is very much in support of Gog–who, after all, healed his face. 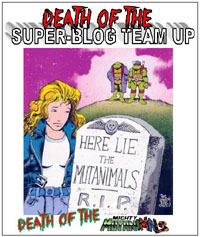 Others point out that Gog sent Power Girl to an Earth 2 where she was hunted as a traitor, and we see Dr. Mid-Nite and Sand both dealing with the negative repercussions to their being “cured” of what had seemed on the surface to be a curse. As “war” breaks out within the JSA, it appears that Gog might finally tip his hand, as we approach “The Seventh Day” which may or may not usher in–through Gog–the end of the world. There’s a lot going on in this issue, and a lot of characters juggled. While it’s easy enough to lose track of everyone, Johns still manages to keep things engaging by focusing on several characters and let us see their arcs unfold in context of the larger whole. What began with the apparently simple premise a year ago of “Kingdom Come Superman arrives on New Earth” has become a lengthy, enjoyable epic that has drawn me back to the Justice Society and made the team a favorite. This is a story that will likely go down as one of the definitive Justice Society runs. The art is–for the most part–well-suited to the story. There are a few points where characters appear a bit “off” (one panel has Superman looking like he ate too many burritos too quickly)…but as a whole, no significant complaint art wise. It’s easy to follow visually, and none of the characters seem unrecognizeable. I’ve enjoyed these specials. While a bit pricey–both cover price, and simply by their very existence at all–I think they make for a great addition to the JSA narrative, and allow for far more than we could get with just the core title alone. It is unfortunate, though, as we have important events in these that are certainly key to the overall story, such that if one wants the full story they are essential and one will have missed a great deal reading “only” the core JSA title. There’s a double-page pinup-style spread of the Earth-2 Justice Society included–I’m not sure I “get” exactly why it’s included…but it’s a cool little “moment” of that team sitting for team photo…there’s a lot going on in that one image that says a lot about the characters without dialogue needed…it would make a great poster. All in all, a good package that–despite the higher cover price–feels like something special and important,and is worth the money paid. You could do so much worse by way of out-of-core-title tie-in specials in a major story.